How can libraries help their research communities implement the FAIR principles? And write better data management plans (DMPs)? The adoption of FAIR principles within the H2020 funding programme means researchers now have to pay much more attention to how their share, publish and archive their data. Recently, Europe's main association of research libraries LIBER held a Webinar on this topic, with Alastair Dunning (Head Research Data Services at the TU Delft) as the guest speaker. A recording of the webinar is now available HERE. 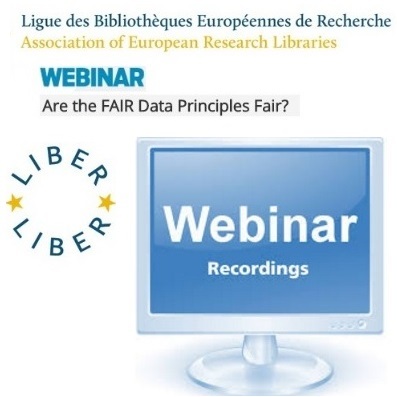 The past LIBER webinar - organised by LIBER’s Working Group on Scientific Information Infrastructures - contained some guidance and reflections on the FAIR principles themselves and data management plans (DMPs). the principles can be interpreted, which of the principles are easy to implement, and which are more tricky. LIBER Webinar : Research Data Services Survey (if your library is looking for insights on how to manage research data, along with an overview of how libraries across Europe are gearing up to handle increasing volumes of data). LIBER Webinar : 23 Things About Research Data Management focused on a set of free, online resources and tools aimed at changing how you manage research data.